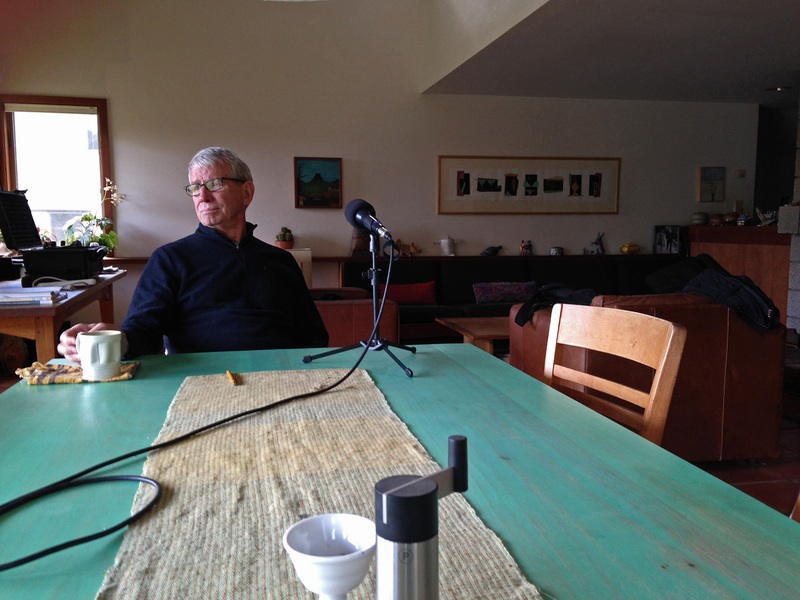 Mark Pharis during his interview with Ben Carter. An excerpt of an interview by Ben Carter, transcribed by Heather Wang and edited by Elenor Wilson. Ben Carter: Would you talk about why you started to hand-build, in terms of developing an individual voice? 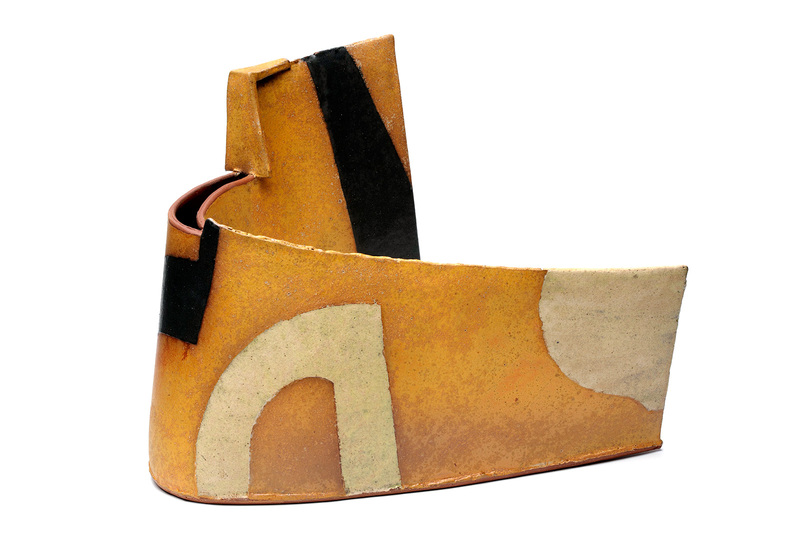 Mark Pharis: I had been making some teapots and covered jars that were altered on the wheel, and then I shaved them completely so that there wasn’t a throwing mark on the outside. Once I started to make those a little bit larger, I thought, “There’s no evidence of throwing here, visually, except on the inside.” They weren’t pots that were about insides. They were pots that were all about outsides and form, not necessarily decoration or surface or painting. I very gradually started to work with slabs and tried to figure out a way of measuring and holding form. That led to making things with patterns or using patterns as a means of making shape and volume. BC: Can you describe, very basically, those early processes of working with a flat pattern, then animating the object around a volume? MP: I had been throwing some – if you look at them from the top – diamond-shaped vases. They were two-sided, wider and flatter than they were deep. I made one quarter of that shape into a pattern that, if I had four of those, could make this volumetric, diamond-shaped vase. I had the thrown objects already, so it was a matter of just figuring out how to make a flat shape that would make the volumetric shape. That was pretty easy, but then I wanted to make forms that had more complexity in profile and volume. The process got murky pretty quickly. I spent a lot of time, just trial and error, making things in two dimensions, then forming them into three dimensions. I should’ve gone to a library earlier. [laughter] Because the information is out there. It’s not that the world hadn’t made patterns before; it’s just that I didn’t know about it. When you start to see something, and you become passionate about it or deeply interested in it, you begin to see it everywhere. It’s already there in the world in some form, or there’s something analogous. If you’re open to slipping sideways, one way or the other, you probably can find something that helps you. I ultimately ended up with some sheet metal instructional manuals. BC: Do you feel like intuition is somehow a recycling of cultural knowledge that the individual picks up on? Or, what do you think about intuition in your own creative process? MP: Well, there’s the objective world, which intuition probably isn’t part of directly. For example, you know that a circle is round. And then there’s the intuitive world that lets you draw a circle with an interesting tool, and you give it some emotional credibility because you like the way the line wiggles, or its thickness or whatever. [laughs] So I’m sure there’s a reservoir of stuff we all draw on, but because we’re different people, we see different things in the world. 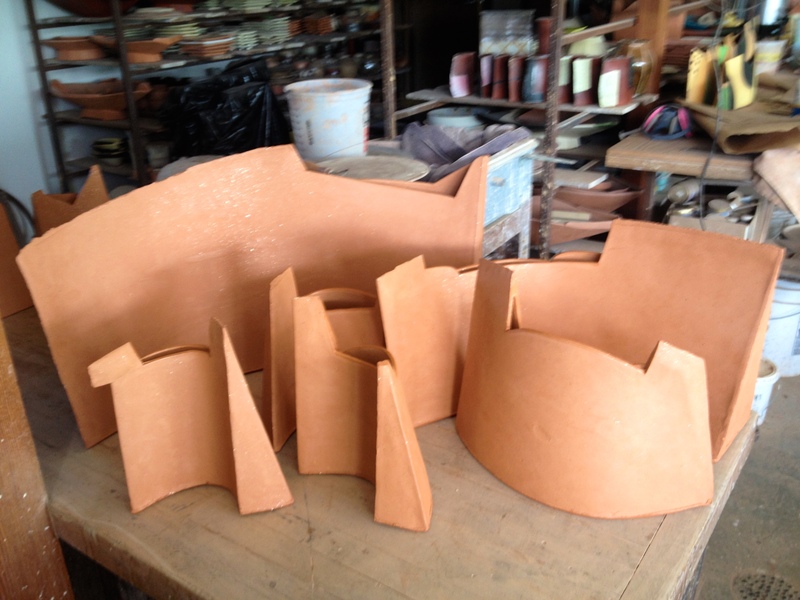 MP: Foundry patterns and sewing and tin-smithing are all interrelated. The math is kind of the same, and at its core it’s pretty basic. It doesn’t even really have to be math, but once I started to do some of this, I needed a little math. Then I understood how I might have taught plane geometry differently if I had been teaching it at that time. It was always taught in the abstract. The math was in the service of the math, as opposed to the math being in the service of a product. And once the latter happened, I was interested in the math of it. I would find my way around using math any time I could, but a pragmatic relationship was really important in having it stick for me. BC: There are mathematical principles humans are attracted to, like the Golden Mean. Have you noticed any mathematical principles that relate to the forms that you make or the things that you like? MP: I revisit certain proportions a lot. I might do a sketch or a drawing and ten years from now draw something else that will have similar proportions. So there’s something kind of embedded. It may be connected to our bodies, our physical size, the way we relate to the world; how tall, how short, how heavy, how fat. I think we end up seeing the world differently because of our physicality. So does our physicality affect the way we, you know, draw a line? Sure. I think you could roll that out in a bunch of different ways. BC: You started off doing a lot of throwing, and as you moved to hand-building with these patterns or templates, did those proportions or the things that you find attractive about form, generally stay the same? MP: The things that I like about form have stayed, generally, the same. Before I totally switched, I was kind of going back and forth, and they informed one another. There’s no doubt that throwing has informed hand-building. An example of something that I think is important in pots, whether they’re hand-built or thrown, is the sense of an inside hand. You can feel it in thrown work, almost always – not universally always, but most of the time you can look at an object and you can sense the activity of the inside hand; a sense of tension or looseness or whatever is there. It’s not an outside-handed activity. In hand-building, or at least working with slab, often there’s something kind of neutral about that. You don’t necessarily feel a pressure either way, or a sense of volume coming from the inside. That’s really critical for me, to create a sense that there is some kind of pressure from the inside, that it’s not all work that’s done from the outside. BC: And that softens the forms tremendously. Like this yellow teapot over here. And in that body of work is something very mechanical, and at the same time very human. I think it’s hard to strike that balance between something that feels fleshlike but also feels metal-like, or tense, or stretched. MP: Well, that’s a good example of having some compression on the outside, having some fullness from the inside. In a way, that is uniquely associated with the wheel. Rigid, slip-cast work, for instance, doesn’t have that sort of mutability of volume; a sense of plasticity. BC: I was trained as a production potter, and there are all these rules that are kind of thrown around as if they were the truth. But they’re usually only the truth for that specific situation you’re in. One of those is that you want to be able to have smooth, even surfaces for your slips or your glazes. MP: I don’t think I’ve left functional pots. I think I want to see what the edges of functional pots are about. I know what the center’s about, but knowing what the edge is about is an ongoing experiment. On the continuum of utilitarian ware, what you said about smooth matters in some instances, but in others it doesn’t matter at all. If you’ve got a cup and you’re sticking it in your mouth, it matters. But if you’ve got the outside of a vase, no one cares. And vases are in a different location; they’re usually at a distance, not in your hand. There are all these things that would be true of a cup or a plate that aren’t true of a vase, so I think you can use context as permission to do things with a vase that wouldn’t be appropriate with a cup. BC: I noticed a simple distinction between a vase of yours without flowers and a vase with flowers; it sure did make a difference to see the irregularity of the flowers coming out of something that was so evenly considered. I think the edges of the utility, as you said, are often playing with what’s organic and what is rigid. MP: Well, “utility” is one of those words that sounds like it has rigid meaning, but the meaning is really quite flexible. I think the vase-cup continuum is an example of that. I do think about those vases functioning, but a vase that functions has really got lots of possibilities. It doesn’t have to be anything in particular. It’s got to hold some water, and it’s got to make sense with whatever goes in it. But there are no rules around that. It’s pretty wide-open. BC: How and when did you start to use CAD to help design objects? MP: I was doing patterns longhand, or analog, if you will, using a straightedge, compass, and square, for a long time. I was making a two-dimensional thing that was gonna be a three-dimensional thing, but I didn’t know what the three-dimensional thing was gonna look like. It was a guess until I’d assembled it. Trial and error was driving me nuts because I’d get it wrong so much of the time. And I thought, there’s got to be an easier way – a way of doing this digitally. When I started hand-building these patterns, it was 1980. And by the time I thought that there’s got to be an easier way, it was about 1997. A long time had passed in the digital world. I actually went looking for something that would unfold a form. There were plenty of CAD programs out there, but they didn’t always allow you to flip back and forth between dimensions. I found something at the time that was called Touch 3D, made in Sweden by a guy who was boatbuilding, and also doing product design, cereal boxes and stuff like that. I got a copy and let it sit for two years to kind of age before I actually learned it. I had some apprehension about the departure from the hand to the computer, and what was that gonna mean to me as a thrower. Even though I’d been hand-building a little bit, my identity was all about being somebody who could throw reasonably well. I did eventually get to the point where I figured out a few things I could do with this program and began to use it. It’s a tool that allows you to see things you can’t see, easily, and it gives you the confidence to do something that you don’t know how to do or that you don’t have the time to do. I probably could make analog patterns of most anything, but I don’t have that kind of time; I don’t want to do it that way. BC: I would imagine CAD allows you to make mistakes digitally, change the design, and by the time you get to the pattern, you’ve saved yourself more time in another stage of the process. MP: That reminds me of a question you asked earlier, which had to do with intuition. Throwing is an intuitive act. You’re watching the form rise in your hands. You’re watching the profile of the form because you can’t see the whole form. You’re watching a piece of it. You’re intuiting when it’s done or when it’s overdone or when you need to change a surface or remove a finger mark. These are all momentary decisions. You run out of clay, the clay’s in the air, you’ve got the form, more or less, and you decide: that’s good. It all happens within a certain time frame. The judgment is made relatively quickly, based on, more or less, the profile and a sense of surface. Using a CAD program changed that process enormously because you don’t have the material directly in front of you. You can do it by profile if you want, making those same kinds of judgments, or you can do it mathematically. Iterations are really easy because, like Photoshop, you can copy-paste, and then suddenly you’ve got a whole new object. You can change that object, and cut and paste again. You can create gobs of iterations in a very short period of time, none of which are actually objects, but they’re on the way to being objects. [When I started using CAD,] I could [play with proportions] more objectively, meaning I wouldn’t intuit a form, but I would decide that form A or form B was going to be fifteen percent taller and ten percent wider than the next form. I had control over all three dimensions. I could just make up a formula and plug it into the same form or the same piece and do it again and again. It’s very simple math, but it has very real consequences when it comes to making an object or creating proportions and volume. BC: So, that teapot and this vase here are made in similar ways, but there’s a different sense of volume in each, and there’s a very different way of approaching form. Can you talk about what changed? 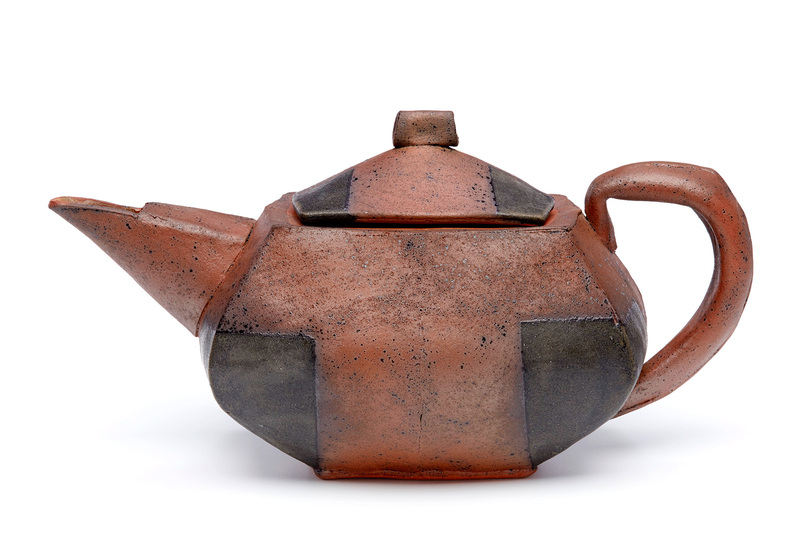 MP: The teapot that you’re talking about is a pot that’s viewed on profile, like lots of pots are. There’s a sense of a center line, a sense of it being two-sided: you anticipate that the other side is like the side you’re seeing, so you don’t necessarily need to see the other side to know what it looks like. This bent-wedge vase behind me, I don’t think of it as sculpture, but it has some sculptural considerations, in that you can’t anticipate all the form from one angle. It’s interesting how little it takes to move into that arena, in terms of creating form. The volume of the teapot is full, and there are a lot of assembly marks, points of interest that get in the way, for me, of doing much with the surface intentionally. The vase is two planes: there’s not a lot of volume, and so it’s much more like a sheet of paper that’s standing on edge. BC: Because the newer work has less volume, did you start thinking more about surface, in terms of breaking up color or enhancing the planes that make the form? MP: The lack of volume has something to do with having flowers in the house all the time. You can go broke [laughs] if you’ve got a vase that takes twenty to twenty-five dollars’ worth to fill every time. 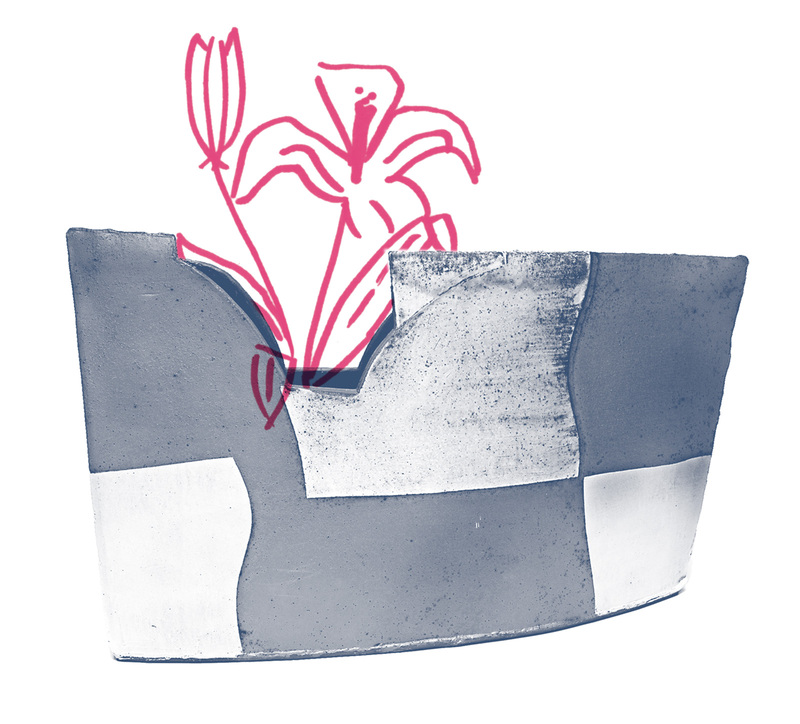 So I was thinking, well, I can make something that’s small and narrow and hasn’t much of an opening and get by with three tulips and probably populate two vases out of one bunch. So part of it came from wanting to make something that would look good with not much in it. The other part was feeling modestly more comfortable with surface. It doesn’t feel like decoration to me anymore. It feels more like a painting activity. I know that’s treacherous ground, but it feels like the considerations are more architectural, or they have more to do with color-field painting. BC: Seeing them together, they feel similar to the way that homes that are close together feel, versus the way that pots that are close together in the cupboard feel. There’s enough angularity in the way that you handle the color that they feel monumental. They don’t have this sense of being handheld or being domestic, even though they can be used in a domestic space. It’s sort of a different wheelhouse in terms of the references. MP: Yeah, I’ve hung around an architect for most of my life. I was interested in architecture before Wayne [Branum], but got more interested after we started sharing a working space. Then there’s the artist Giorgio Morandi, who’s kind of a minimalist in many ways, in color field relationships, and also Luis Barragán, the Mexican landscape architect who’s using stucco, and others. All of their work seems really close to me in some ways. They’re cut out of the same cloth. And the structure, from architecture, obviously, is planar. To hear the full interview, visit talesofaredclayrambler.com or download from iTunes, Stitcher, and other podcast listening services. Mark Pharis is a Minnesota potter. His three-dimensional forms are handbuilt, using two-dimensional paper patterns. His process owes much to the traditions of patternmaking found in sewing and sheet metal work. 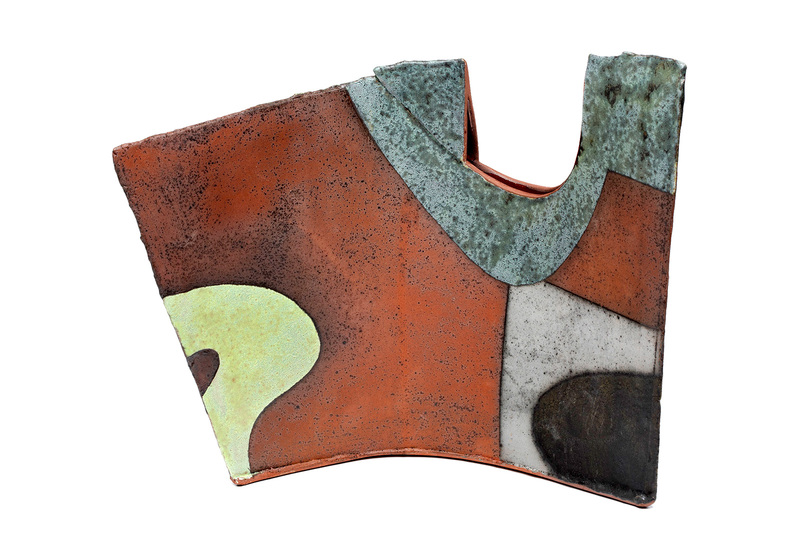 Mark began his career at the University of Minnesota with Warren MacKenzie in 1967, and after working as an independent potter for several years, began teaching in the Department of Art at the University of Minnesota in 1985.